The Russian rocket-powered landing system. No place for a hard landing. All previous Soyuz descent capsules have been slowed via a combination of atmospheric drag (hence the need for ceramic tiles to withstand the extreme heating inflicted on the vehicle), parachute-aided descent and then a small burst from a solid rocket to ensure a soft landing. Apart from a few ballistic re-entries, and a few early fatalities (Soyuz 1 and Soyuz 11), this system has worked well. Unfortunately for Roscosmos, Moscow has decided to move space launch and landing operations out of the newly independent republic of Kazakhstan to a new spaceport being constructed in eastern Russia. This imposes a huge design restraint on the new spaceship, it can’t use the vast wilderness of Kazakhstan to parachute into. The current primary landing zone for Soyuz is 25×30 km, making a reasonably-sized target for the descent module to aim for. Even during the bungled April 2008 hard landing, where a ballistic re-entry forced the Soyuz descent module to miss the 750 km2 landing zone by 400 km, at least there was plenty of flat Kazakhstan to bump into. The new landing zone will be 1.3% the size of the old one, meaning the new landing system will have to be more precise than a parachute-aided landing. Cue the rocket-powered precision landing descent vehicle for Russia’s next generation spacecraft. Although I love the artistic rendering of the spaceship in orbit and the descent vehicle (the panels riveted together and scorch-marks are a special gritty pleasure for me), to rely on a rocket powered landing seems a little risky. This next generation descent vehicle will have one of the most insane landing profiles I have ever thought possible (“possible”? I use that word very lightly). Basically, using atmospheric ablation to slow it down in the first instance is perfectly fine, Soyuz does, as does the Shuttle, but it would appear that the plan is then to allow the vehicle to fall, at terminal velocity, to an altitude of 600-800 meters before igniting it’s landing rockets. Hold on. Meters? Yes, meters. I spat my coffee across the keyboard too. But it’s OK, the “precision landing motors” will fire at 30 meters, to guide the lander to the 10 km2 landing strip. If one of the landing rockets didn’t fail (or slightly under-perform) that is. Call me cynical, but I’d be happiest if I could glide into landing on a huge airstrip. If I don’t have that, parachutes would do. Preferably three of them, in case one fails, at least the other two will ensure I don’t end up pancaked inside a flattened chunk of smouldering metal. Hard landings do happen, regardless of how robust a system is, but to depend wholly on a rocket-powered breaking system to get cosmonauts and astronauts back to Earth seems a little extreme. Perhaps the design of the landing strip needs to be looked at, designing the space vehicle around a landing strip probably isn’t the best way to go. Apparently, I’m not the only skeptic, but the design is obviously being considered. 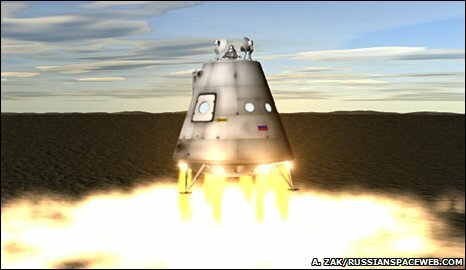 Rocket-powered manned landings have been achieved on the Moon, there have been a few US and Russian designs incorporating rockets and rocket engine technology is becoming more and more reliable. However, to control the descent of a free-falling space vehicle, bringing it to a stop within 800 meters from the ground leaves little (if any) margin for error. How extreme would the G forces be on the humans inside? If you read the actual article, it’s units of measurements are in Meters, not feet. Google gives you a firing height of 1,968.50394 feet (approximately). What? From the self same BBC/ Anatoly Zak article. “Christian Bank, the leading designer of manned space systems at EADS-Astrium in Bremen, Germany, which at the time was responsible for the European side of the ACTS project, agreed with the validity of this novel Russian approach toward landing. “If the craft’s landing engines were to fail, the propulsion section would have to be jettisoned. Otherwise, the propellant-laden ship would be too heavy for a [backup] PARACHUTE [my capitalisation] to handle. But please don’t let the FACTS stop you from the important task of criticising America’s space taxi service to the ISS. How IS Orion these days? Actually, these aren’t facts, they are personal opinions. This is a brand new way of landing a space vehicle, never been done. My concern is that 600-800 meters does NOT leave much room for error. My personal feelings are that I’d much rather have a set of wings or a parachute. Would you choose an rocket-powered landing? It won’t be a pleasant landing by anyone’s measure. Here’s a thought. Sometimes people want to write/say “meters” but since they have to use the standard measurement system all day, they write or say “feet” having read the article. So before you try to rub their noses in, you might want to consider this possibility. Thanks for sharing . This information is useful for me.